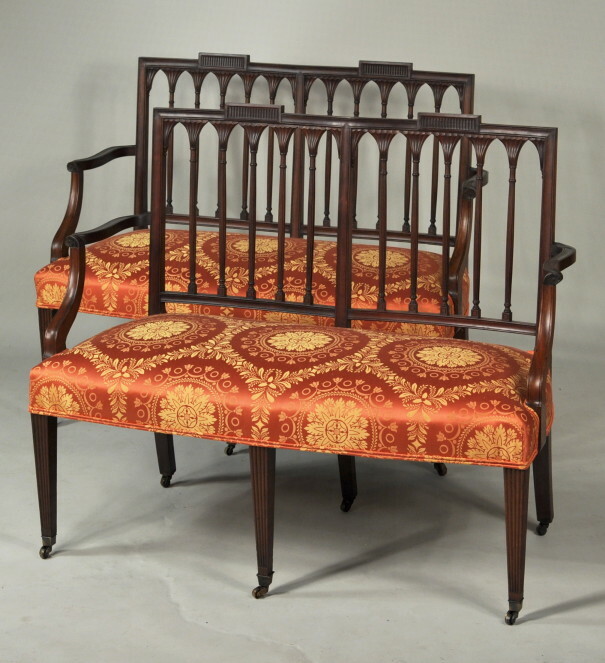 Rare pair of hepplewhite carved mahogany double chair back settees, square backs with raised fluted tablet above turned and reeded colonnettes, with carved serpentine arm rests and shaped arm supports, with upholstered seat set on square tapering reeded front legs and raking rear legs, all set on brass casters. Manner of Slover & Taylor; both bearing label Sypher & Co., New York, late 19th century. 44" wide, 35" high, 21" deep, 16" seat height.